Stem cells from the umbilical cord are special. They are young, potent, and viable. They have already been applied in more than 30.000 medical treatments and have the potential to revolutionize the future fight against disease. 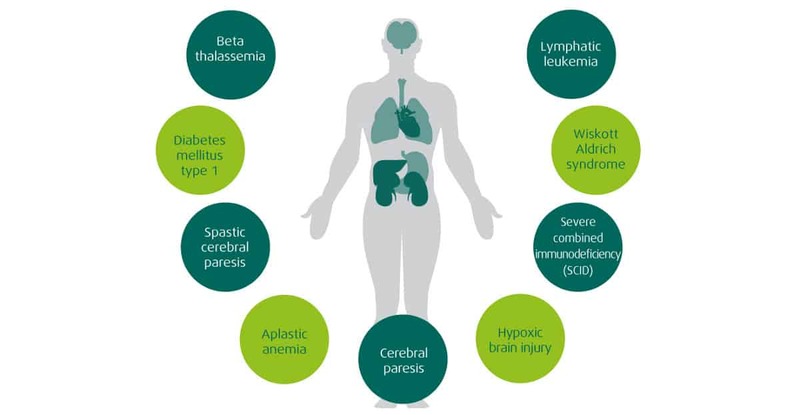 Clinical studies conducted across the world show the usefulness of stem cells in regenerating tissue damaged by accidents, degenerative disorders and in development of cancer treatments. Stem cell therapies give hope to many patients and are an important therapeutic option. Vita 34 actively participates in this development. We are involved in basic and application research with our in-house department of research and development and in collaboration with leading universities and research institutions all over Europe. Vita 34-customers benefit from this knowhow: The expanding knowledge in stem cell research makes your child’s stem cell deposits even more valuable every day. Stem cells have been applied in the treatment of serious diseases for more than 55 years. They are applied especially to treat cancers, which require high-dose chemotherapy within the scope of medical care. The patient’s own stem cells are extracted from bone marrow or peripheral blood prior to high-dose chemotherapy, stored temporarily and transplanted after the treatment in order to minimize the side effects of the aggressive chemotherapy and to support the regeneration of destroyed cells. Besides cancer, several 100,000 people get diagnosed with common diseases like dementia, which belongs to the neurodegenerative diseases, cardiac infarction, stroke, arthritis, or diabetes every year. The lifelong therapy has enormous costs to the health care system. Stem cell therapy offers great potential for the treatment of such diseases. 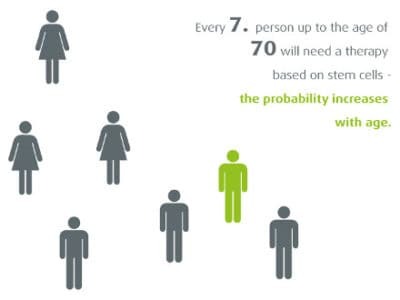 Experts estimate that every seventh person up to the age of 70 will need a therapy based on stem cells in the future to regenerate sick or aged cells and tissues. The transplantation of stem cells requires enormous knowledge and experience. Stem cells stored with Vita 34 have been applied successfully 30 times. They were applied in the treatment of cancers such as leukemia and neuroblastoma, hematopoietic disorders like aplastic anemia or beta thalassemia, immune defects like SCID or Wiskott-Aldrich syndrome, infantile brain damage and infantile diabetes type 1. Additionally, when measured by applications in clinical treatment attempts and studies, Vita 34 is the most experienced private stem cell bank in Europe. Scientists expect further findings and developments in the field of stem cell therapy in the coming years. Areas of application of stem cells.